The Houston Rockets were pleased to announce a collaboration with Travis Scott, which was released exclusively at the Western Conference Semifinals this past Thursday, May 11. 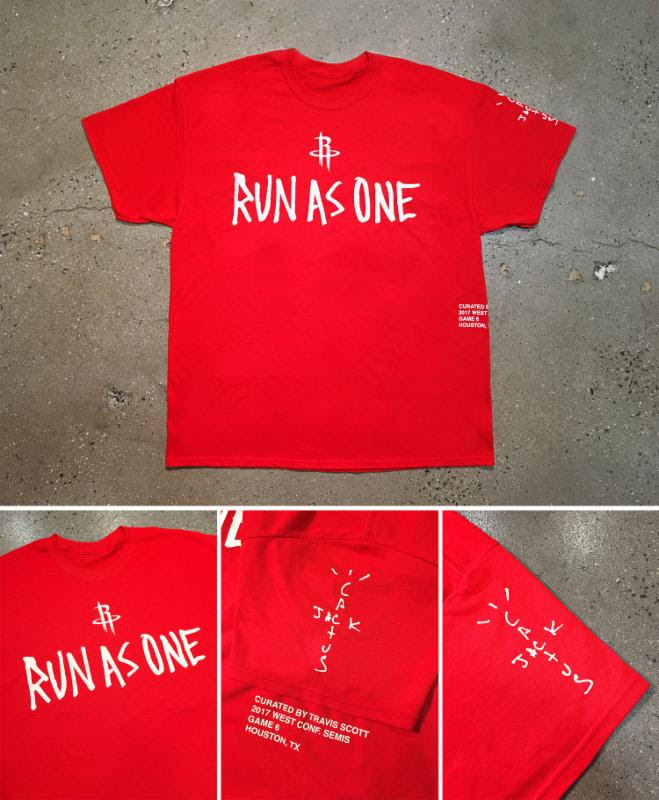 In celebration of Game 6 at the Houston Toyota Center, every fan in attendance will received the first ever Houston Rockets x Travis Scott Limited Edition T-shirt, which features the 2017 Rockets playoff slogan "Run As One" written in Travis Scott's handwriting as well as the Rockets logo, and call outs to the artist himself. This collaboration was powered by Bravado, UMG's leading merchandise and brand management company. Travis Scott will was in attendance at the Toyota Center as his hometown Rockets take on the Spurs to headlining his SOLD OUT homecoming show at Revention Music Center on his national BIRDS EYE VIEW Tour that same evening. Undeniably one of the most creative visionaries in hip hop, Scott became a household name after the release of his first album "Rodeo." Travis continued to make headlines when creative directing and performing on Rihanna's recent ANTI tour. Not stopping there, Travis hit the studio to record his critically acclaimed sophomore album "Birds In The Trap Sing McKnight" which was number one on Apple radio for 8 weeks straight. Scott's current single "Goosebumps" was recently certified platinum by the RIAA. Featured in Beats By Dre's new #GotNoStrings & Saint Laurent campaigns, as well as launching a capsule collection with Helmut Lang ,Scott was also recently named "Music's New Fashion King" in his Spring/Summer 17 GQ Style cover story.